Written on January 30, 2009 by Rylan & Kaitlyn. We had a fun night last night when we met up with all of moms aunt's, uncles and her grandmother too. We went to Jason's Deli which is definitely one of our favorite places to go. We had a good time seeing all of the relatives that we do not typically get to see. I had a lot of fun running around the table while Kaitlyn sat in her high chair trying to stick it through her sickness. She still has a cough and runny nose. This morning dad was there to say hello. He decided to stay in a bit to make sure Kaitlyn was ok. He took off for work a bit ago and now Kaitlyn is at the window yelling "Daddy. Daddy.". It's always exciting to see him get out of the van and unlock the door. It's nice to see him come home. He always gives great hugs and kisses. To wrap things up for the week. Mom had been playing one of her Wii games for a while now and all of a sudden her information was all gone. Dad doesn't think it was him so it must have been me. I did sell her turnips that she had on the game so they think it was me that deleted her information. She is definitely not happy about having to start all over again. Needless to say, the Wii has been locked down which is a real bummer. We have a big weekend ahead of us with a lot of visitors so we need to get the house all ready for them. Have a good weekend everyone. Oh by the way, for those curious, our dad's blood work came back OK. Yippy. Written on January 29, 2009 by Kevin. Kaitlyn has been able to fight it off for 18 months now but last night she finally started to have her first real sick night. She has run a slight fever and has been coughing all day. I understand though that she has been well pampered and soaking it all up. I think she will make it through. Written on January 27, 2009 by Kevin. Our family is not currently involved in any clubs here in town or on the internet but I think the new Qlubb.com may be the place to organize it if we did. They seem to have put together a great website which allows you to keep track of everything needed and keep everyone on the same page. If you're needing help getting a club or group organized, take a look at Qlubb.com; it may be exactly what you are looking for. One benefit.. and cross contamination.. Written on January 22, 2009 by Kevin. There is definitely one benefit of having a member of the family with a severe peanut allergies and that is not having to worry about the salmonella outbreaks that seem to effect peanuts every so often. Sure its possible that sunflower seed butter could become a carrier someday but with extensive testing that the brand Sunbutter does, we can feel safer. On to cross contamination.. Yesterday I fasted for nearly 20 hours in prep for some blood work that was needed. I was at a point where I just needed food to regain my energy rather than fill my hunger. We packed Kaitlyn a bento box and headed out. I had my blood work finished and we decided to hit up the local buffet so I could have all the food I needed. We are always very cautious about eating out of the house and always prepare Kaitlyn her own food. There is absolutely no way that anyone with severe allergies would be able to eat a buffet due to people cross contaminating just about everything. A great example is the food manager using a thermometer to verify the right temperature of food but going from item to item without using a new clean reader. Everyday our eyes are opened more wide about how much of a problem these allergies can be to deal with. We find new things that are safe for Kaitlyn but realize now that as she gets older we will be unable to go out. She clearly wants our food and not her bento box. This is fully understandable. We will be eating at home even more now. Written on January 16, 2009 by Rylan & Kaitlyn. Another week has come and gone. Definitely the best news is that we have a new cousin. She was born on Tuesday. We went over to her house last night to bring over some food that Dad made. She's a cutey but Kaitlyn and I were more interested in playing with Hayden's toys. Kaitlyn did give her a couple kisses though. Our mom has already given the new baby Mackenzie a whole bunch of hair bows. She is getting a whole bunch more soon because of the CPSIA. She has a pretty good amount of hair already so hopefully it comes in fast. Oh ya. Kaitlyn and I have been making bread this week. In fact, we brought a loaf over to our Aunt and Uncle's house last night with dad's meal. We make tiny little loaves that are pretty good. We get to put all of the ingredients into a plastic bag and mix it up. Then mom gets to knead it and put it into the pans. They really make the perfect size loaves for us. Kaitlyn says that they are pretty darn cute. Oh wow. Our house has been overflowing with muffins lately. Ever since Christmas when mom and dad made a bunch of pumpkin chocolate chip muffins in fact. They made a bunch for people at our dad's work. They are super super tasty and we all can't get enough of them. It seems like we are making a few dozen batches a week. Did I mention how tasty they are? Yummy! Oh well we can't forget to mention that there was a shooting just about outside our house the other night. As dad was driving us through our area, they heard a bang and as we turned around a corner there were more bangs. Dad says that we were about 3 seconds from being in the crossfire. Luckily there was a place for dad to quickly turn so that we could avoid everything. There were so many police men in front of our area and in the back too. It was some crazy stuff. I think that's about it for now. Have a good weekend everyone. We have a few things planned but nothing too special. Written on January 15, 2009 by Kevin. Kaitlyn and Rylan's new cousin has arrived. 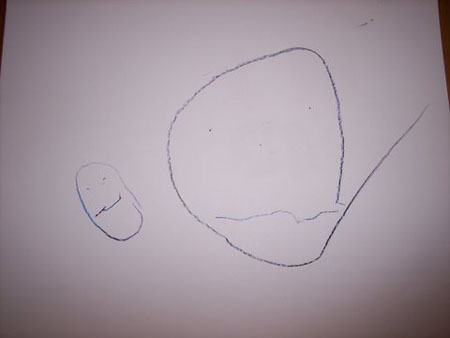 Rylan celebrated by drawing a picture of her and her big brother Hayden. Here is the first look. The kids will get to see her later today. Written on January 12, 2009 by Kevin. I learned about bento boxes a while ago and was very interested in them. For those who don't know, in the most simple form, they are meals in a box. They are portioned out to encourage healthy eating while not overeating. I thought it would be a great idea to get the kids started on these young. Making the meals fun by turning basic rice into molded shapes is just a bonus. Last week we were on a hunt for some of these boxes. We spent last Monday driving to each of our small selection of Asian markets. We found a few great stores but never found any boxes. We waited until Thursday to check out the shop right next to our place and they knew exactly what I was looking for while the other stores did not. We picked up a few boxes at a reasonable price. We were surprised that the prices even beat those on EBay. We headed back to another Asian store we have previously gone to so that we could pick Rylan up some trainer chopsticks. While there we found the same boxes. Apparently we totally missed them in the huge assortment of plastic goods. For those worried, these plastics actually come from Japan rather than China and show a safe plastic number. We made Rylan and Kaitlyn a box the other night for the next day and from the picture below, you can see just how happy Rylan was. Kaitlyn was just as excited but the picture we had taken just didn't turn out. 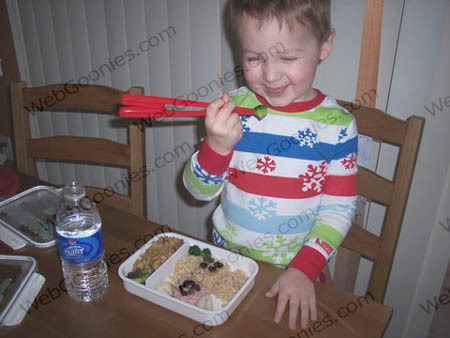 Rylan ended up getting different chopsticks than we had originally purchased and he is doing quite well with them. They are trainer sticks that he loves to pick tiny chocolate chips up with. Kaitlyn loves picking at all of the goodies with her hands at the moment. I think that these will be great to encourage an assortment of foods for the kids. We have already tried a few new things and will continue to do so. These boxes will work great for Kaitlyn so she can have a very safe meal when we are out eating or with the grandparents. Sure we could do this with basic Tupperware but where is the fun in that? Bento boxes definitely get our approval. Written on January 11, 2009 by Kevin. It has been 3 months now since my tester began the Sensa weight-loss system. Initially I understand it was difficult for them to get into the habit of sprinkling the food with the tastants. They have reported back to me though and mentioned that they have lost a total of 6 pounds at this time. They said that it took a few months before the pounds became noticable but they have seemed to make that turn. If you are interested in trying the Sensa, I would recommend taking advantage of the coupon they are offering now. ROCKETXL will earn you a 15% discount plus free ground shipping. Check out http://www.trysensa.com/ for further information. Written on January 9, 2009 by Rylan & Kaitlyn. Well let me think of what Kaitlyn and I did this week. This week seemed to go by pretty quickly even though we didn't do much. Kaitlyn can't really think of what we did either so I guess we will talk about what we are going to do this weekend. Mom has been talking to me about baking our own bread. I think the plan is for mom and I to make that together. It will be a special project just for the two of us. Depending how the bread turns out, we are going to make a second loaf and give it to our Aunt Jenette who is due to have her baby any moment. We are going to make a big feast and then throw in the homemade bread too. I think it will turn out really good. I love to watch the cooking television channel. Mom and dad think I will become a famous chef. We are really anxious to see our new cousin. Kaitlyn and I both think that she will come this weekend. We gave the new baby a few Christmas presents that will take some time to grow into but they sure were nice. Oh ya, grandpa wants to come over this weekend and go out to lunch with us. We are going to our favorite place called Jason's Deli which has the bestest hotdogs and pizza for the kiddos. Kaitlyn will fine dine on a bento box that mom will put together. More on that in another post. Ya know, Kaitlyn and I need to make something of this week while its still here. I think we will go do some dancing and singing after Dad gets home. He will like that. Written on January 7, 2009 by Kevin. Here is Kaitlyn modeling her newest shirt that her mom put together. The kids always are anxious to try out their moms new items. She definitely is going to stand out with this one.